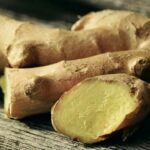 In my last post I wrote about ginger, a hot root you can grow. This time I thought I’d go a bit further and talk about one of the hottest spices you can use in the kitchen – hot, hot horseradish. Horseradish (Armoracia rusticana) is a hardy perennial root spice, growing as far north as Zone 5. It’s a member of the Cruciferae family that includes radishes, broccoli, and mustard – all strong-flavored vegetables. The large brown taproot can reach two feet long and 4 inches in diameter. The glossy green leaves grow in clumps and can be almost two feet long. Horseradish is one spice to plant with caution. Once established in the ground, it may be there for future generations. Digging up the main plant will almost certainly break off lateral roots. It will reproduce from the smallest section of the root left in the soil. One solution is to grow horseradish in a pot where it can be controlled. Keep horseradish regularly watered to keep the roots tender and flavorful. Although it’s happy growing in hot climates it needs regular water to survive, another good reason for Southwest gardeners to keep it in a pot. This rather unassuming plant growing in my south facing garden is horseradish (ignore the pink echinacea blossom crowding in from the right). 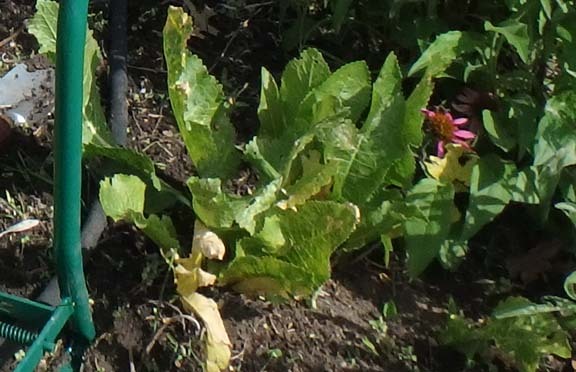 Horseradish enjoys full sun but needs regular water to survive. Mine only lasted a couple years due to the hot Texas summers and not enough water. To harvest it in fall, simply pull up the plant to get at the central root. Slice off the smaller side roots and replant them for future harvest. Discard any damaged or woody roots older than a year. Be sure to wear gloves when doing this. The juice of horseradish is quite strong. If you accidentally get it in an open cut or in your eyes or mouth you will be in pain. Even though it’s quite hardy, horseradish does have a few insect enemies. It is susceptible to leaf damage from cabbageworms. This can be controlled with BT insecticide. The roots are sometimes attacked by the white grub-like larvae of crucifer weevil. Treating a weevil infestation requires digging up the roots and treating them with a permethrin solution. Fresh horseradish sauce is simple to make. Find a well-ventilated location for this task. Outside on the porch might be good. Put on kitchen gloves to protect your skin from the irritating oils. Take 4 ounces of horseradish root and peel it. Using a stainless steel grater, finely grate the root into a glass or ceramic bowl. Immediately add ½ tablespoon cider vinegar, 1 teaspoon salt, and 1 tablespoon sugar and stir to combine. Transfer to an airtight container and refrigerate for up to two weeks. If you prefer a milder condiment, try using less raw horseradish and substituting grated apple to make up the volume. In the kitchen horseradish is a reliable source of fiery heat. Horseradish sauce is standard accompaniment to roast beef. A dash of horseradish is a regular feature in shrimp cocktail sauce. 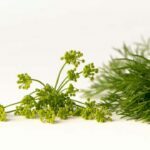 In small quantities it can add a real kick to soups and stews. Horseradish not only provides strong flavor in foods but strong opinions in those who taste it so start small when adding it to a new dish. What is it that gives horseradish its flavor bite? When the root is grated two chemicals stored in the flesh combine to form potent mustard oils. The fresher the root, the hotter the flavor from these oils. To keep the heat under control, add vinegar to the grated horseradish which halts the chemical reaction that creates the fiery oils. Horseradish is believed to have been first cultivated in Eastern Europe and Russia. Then it travelled to Germany where it was named meer-rettich or sea radish because of its affinity for growing in regions along the Baltic Sea. The story goes that when meer-rettich was introduced to the English they thought it was called “mare radish” which eventually became horseradish. Personally, I’m not so sure that’s what happened. The English were fond of tacking the word “horse“ onto the front of any plant name where the plant was somewhat large and coarse (and destined for the table of country bumpkins, not refined lords and ladies). They were familiar with horse chestnuts, horsemint, horsebalm, horseheal, horse tongue and other rural plants. When they encountered this new large root that was a hotter version of radish I think they just naturally called it horseradish. To learn more about horseradish visit the Horseradish Information Council online. You can view the history of horseradish from ancient times to now, discover why some people would rub horseradish on their forehead, and sample a host of recipes.